What's Happening At Queen and Spadina? What’s Happening At Queen and Spadina? 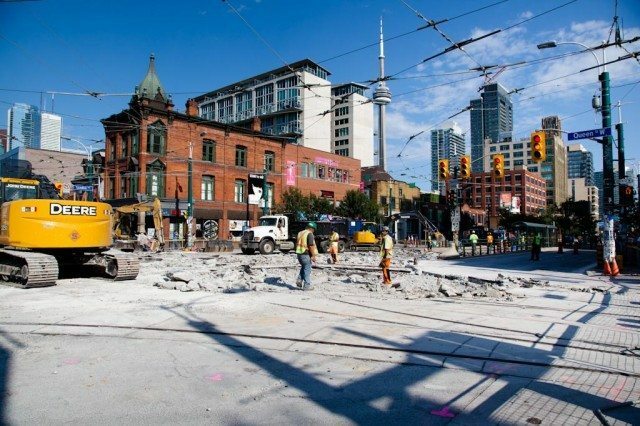 The intersection of Queen Street and Spadina Avenue has been shut down for a week while road crews replace the streetcar tracks there. If everything goes according to plan, the intersection will reopen next week, at 6 p.m. on July 23. Streetcars and buses are diverting around the mess. It’s also completely impossible to drive through the area, so chances are that most commuters haven’t even seen the source of all the temporary chaos. Our photographer has been visiting the site on an (almost) daily basis. Here’s a gallery of photos of the intersection taken over the course of the past week. We’ll update it with today’s photos as soon as we have them.